Polynomial operators are a natural generalization of linear operators. Equations in such operators are the linear space analog of ordinary polynomials in one or several variables over the fields of real or complex numbers. Such equations encompass a broad spectrum of applied problems including all linear equations. Often the polynomial nature of many nonlinear problems goes unrecognized by researchers. This is more likely due to the fact that polynomial operators - unlike polynomials in a single variable - have received little attention. Consequently, this comprehensive presentation is needed, benefiting those working in the field as well as those seeking information about specific results or techniques. 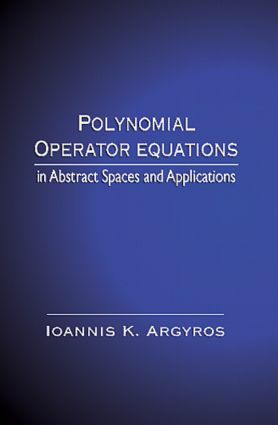 Polynomial Operator Equations in Abstract Spaces and Applications - an outgrowth of fifteen years of the author's research work - presents new and traditional results about polynomial equations as well as analyzes current iterative methods for their numerical solution in various general space settings. The self-contained text thoroughly details results, adds exercises for each chapter, and includes several applications for the solution of integral and differential equations throughout every chapter. "This book provides a valuable service to those mathematicians working in the area of polynomial operator equations…The theoretical material addressed has a spectrum of applications…applications [that are] quite relevant and important…Anyone doing research in this area should have a copy of this monograph." "A comprehensive presentation of this rapidly growing field…benefiting not only those working in the field but also those interested in, and in need of, information about specific results or techniques…Clear…Logical…Elegant…The author has achieved the optimum at this point."